I had starred these cookies in my Google Reader awhile ago, and while looking through my starred items the other day to figure out what to make next, I decided I would try them out. These are from Baking Bites. I guess I go through baking phases, because I made another stuffed-type cookie not too long ago, the Peanut Butter Middles, and I have been on a chocolate chip cookie specific binge for a while. And I just made those Reese's Cheesecake Bars too, so you could say I'm on a cream cheese thing too. I am apparently a creature of habit! Anyway, these cookies. They, for one, are HUGE. I mean, gigantor. Some of the biggest cookies I have intentionally ever made. Unintentionally, sometimes cookies can spread larger than intended due to various circumstances. But intentionally! Yes. Big. Be prepared for big. And messy, when making them. These are not mess-free or very quick to make. I think I started making them around 1pm, then didn't actually finish up the last batch in the oven until like 6 or 7pm! First, make the cookie dough. 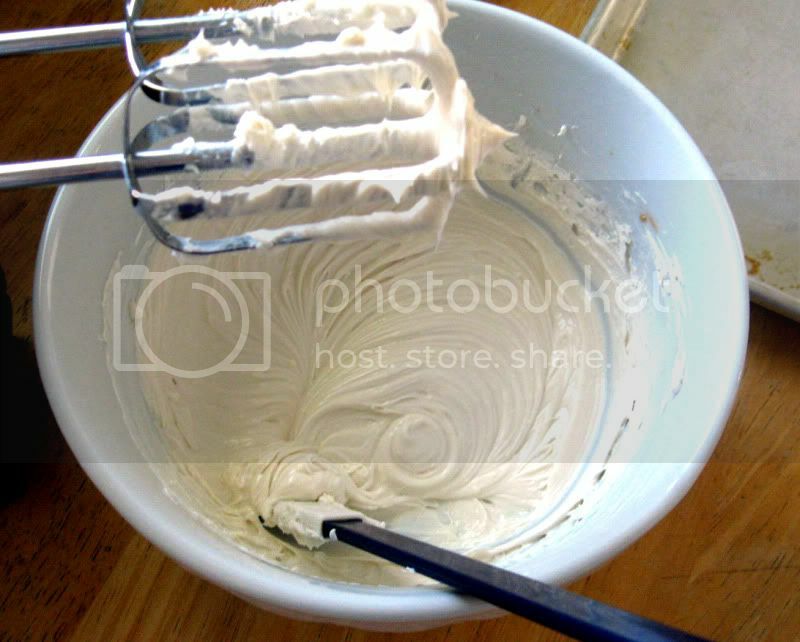 In a medium bowl, whisk together flour, baking powder and salt. In a large bowl, cream together butter, sugar and brown sugar until light. Beat in egg, milk and vanilla extract. With the mixer on low speed or by hand, blend in the flour mixture, stirring only until no streaks of flour remain. Stir in chocolate chips. Divide dough into two equal parts. 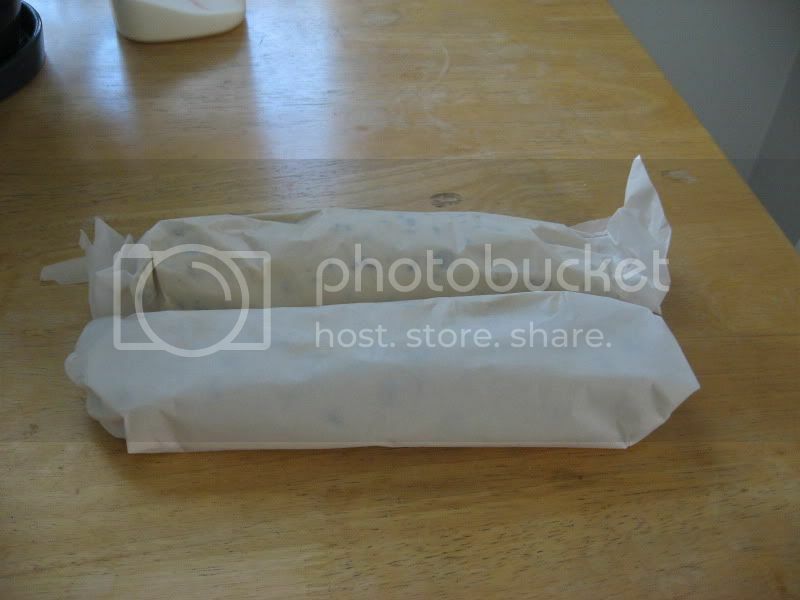 Place each on a sheet of wax or parchment paper and shape into a log. Wrap in paper and chill logs for 1-2 hours, until firm. Make the cream cheese filling. Combine all filling ingredients in a medium bowl and mix at medium-high speed until smooth. Set aside. 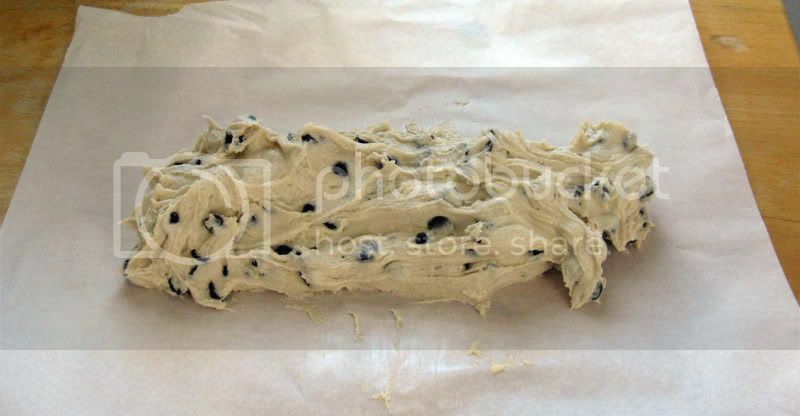 Remove dough logs from the fridge. Using a sharp knife, divide each log into eight even slices (total of 16 big slices of cookie dough). 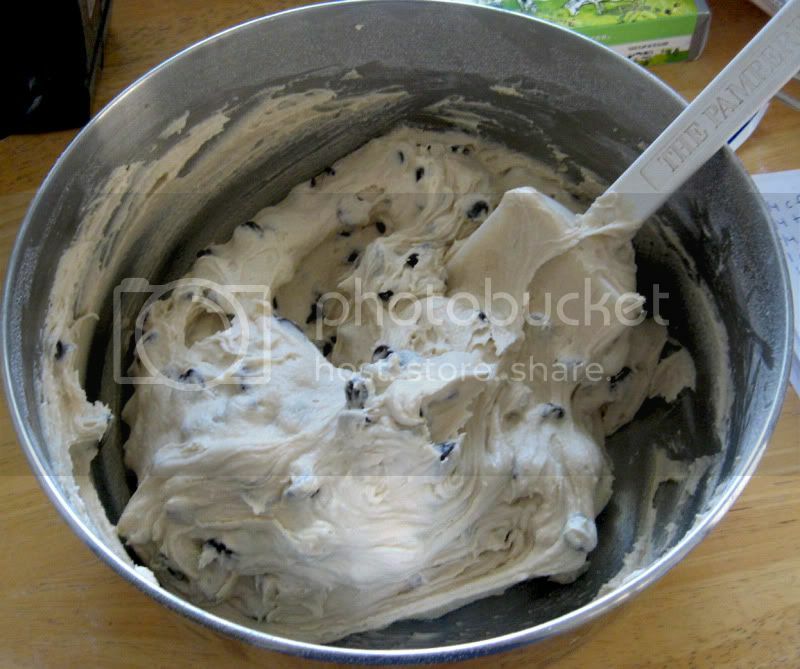 Working with one piece of cookie dough at a time, flatten the dough into a 3-4-inch wide dish between your palms. 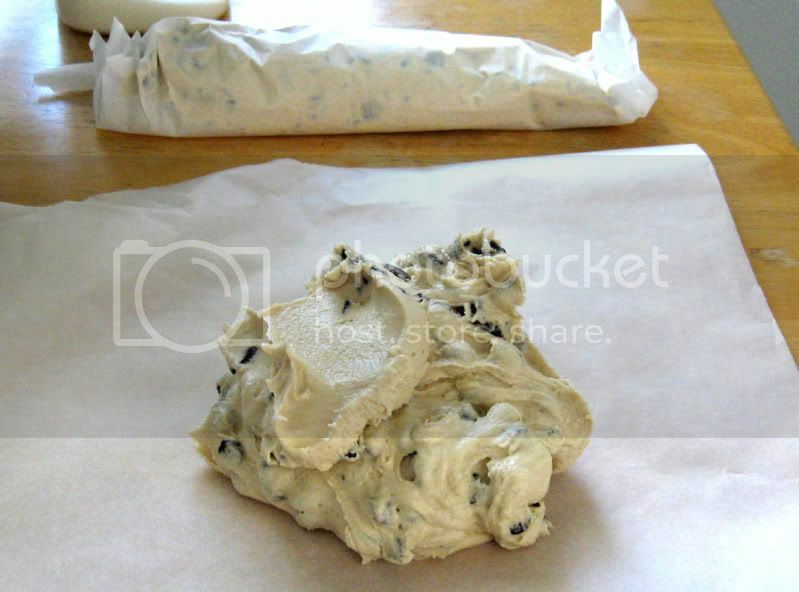 Place about 1 tbsp cream cheese filling in the center of the dough, then pinch the sides of the dough together to seal. Work carefully so all the filling is sealed inside. Place on the baking sheet. Repeat with remaining dough. 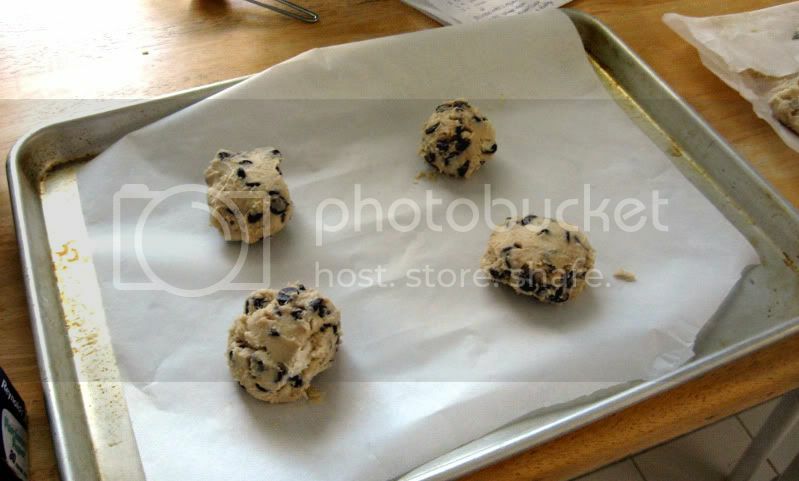 Bake for 15-18 minutes, until cookies are golden brown around the edges. Cool on the baking sheet for 2-3 minutes, then transfer to a wire rack to cool completely. Store in an airtight container. 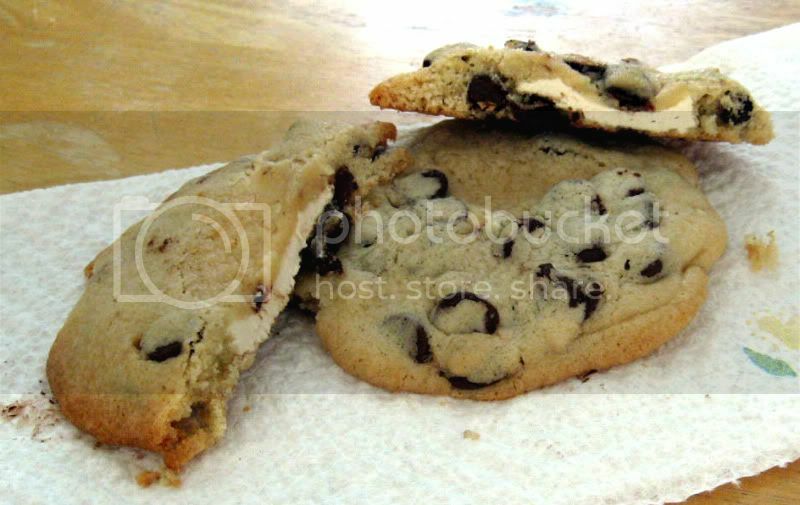 I figure I've had enough step by step pictures of regular chocolate chip cookies by now that you get the idea. If not, feel free to click on one of the above links and see. Also? Lazy. Yep. As you can see, I'd already got one log wrapped up. Here's the second half awaiting its fate. And look at that! It's sort of log-shaped! I used my fingers and the parchment paper itself to give it a general shape. Bing bang boom, they are ready to go in the fridge for a couple hours. With about 15 minutes left into the two hours, I made up the cream cheese stuff and started the oven to preheat. One of the logs all sliced up. I would recommend only doing one at a time. Leave the other in the fridge until you need it. I also re-wrapped this one up and put it back when I had the first four on the baking sheet. And I stress you only put four on the sheet at a time, like so, because they get big. Even these touched each other, I think. I don't have step-by-step pictures of putting the cream cheese globs in the middle, because it's rather messy and when I'm the only one there, I can't do both things at once! TIP: Take off a little chunk of the dough before you flatten it and put in the cream cheese. Once you wrap the dough around the cream cheese, you'll likely end up with a little extra sticking out, but because you took off that little extra hunk of dough before, you can just slap that on it! Once they are baked, you won't be able to tell there's anything in the middle until you actually take a bite (or two) in. I also had to bake these for more like 20-22 minutes rather than the 15-18 stated in the original directions. But I also used soy milk rather than real milk, so who knows if that played a role. My verdict is only so-so on these cookies. They're decent, but not ahhh-mazing. I actually found myself liking the edges more than the cream cheesy middle, so that tells you something right there! I suspect there are many different variations of these you could make, with peanut butter filling, or even maybe a mint filling, butterscotch... the options really seem endless. If anyone ends up making these, you'll have to let me know how you like them!